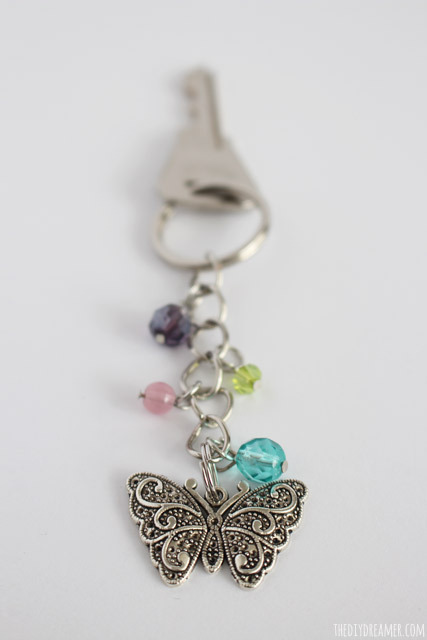 Butterfly Beaded Keychain and 16 more Easter Projects! 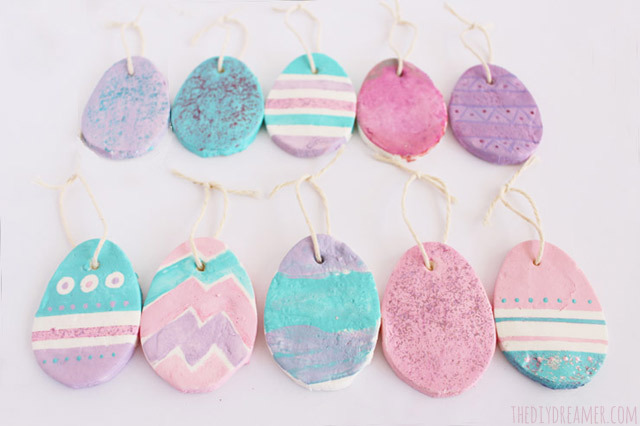 With Easter and Spring just around the corner, my daughters’ and I are in the crafting mood. I like to get them involved with the gifts we give our family members for each holiday. This year we thought it would be fun to give them each a handmade butterfly keychain rather than chocolate. We went with butterflies to give them more of a spring feel, however we could have easily gone with cute rabbits to represent Easter. 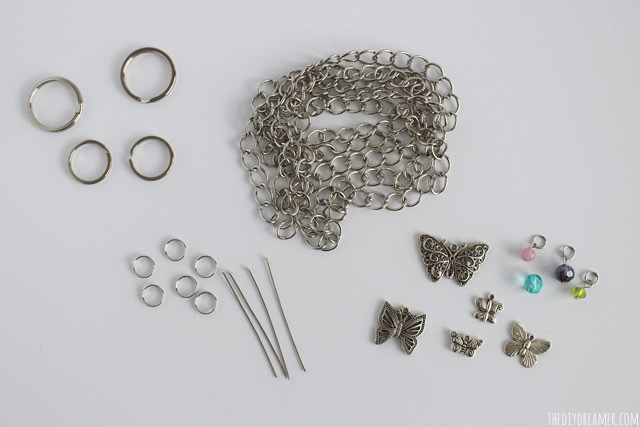 – Small split rings or jump rings. Step 1: Using wire cutters, cut your desired length of chain. Step 2: Attach the chain to a big keychain ring (split ring) and to a small one (I had two different sizes of small split rings, I chose to use the slightly bigger one.). 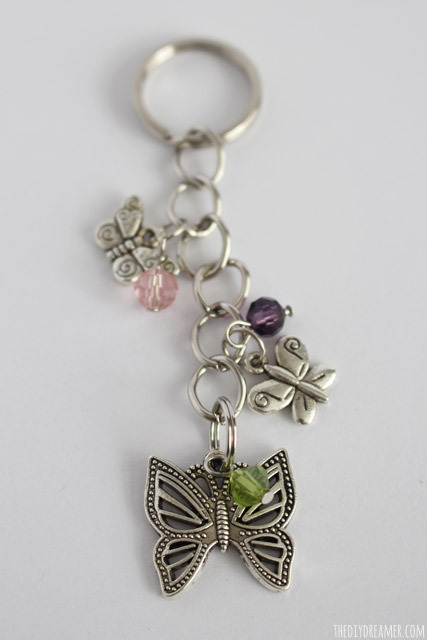 Attach a butterfly charm onto the small split ring. Step 3: Time to take out the beaded charms and to make some if you don’t have any. You can read and see a step by step tutorial on how to make beaded charms here: Silk Wrap Bracelets. The quick version to make them, is to thread a bead onto a pin needle finding, use wire cutters to cut the finding down a little, and use round nose pliers to make a loop with the remainder of the pin needle finding. 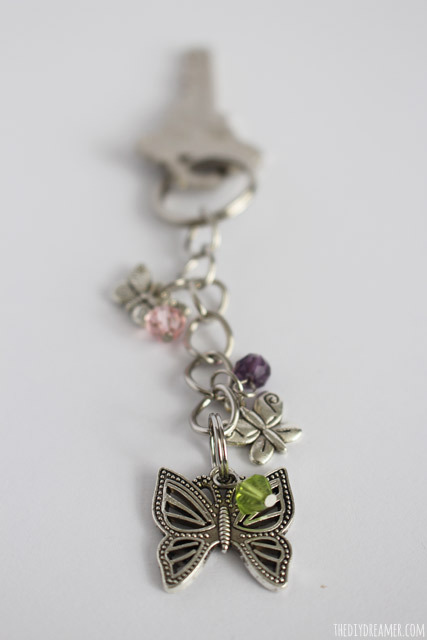 Step 4: Attach the beaded charms onto the chain using small split rings. You can also add smaller charms too! 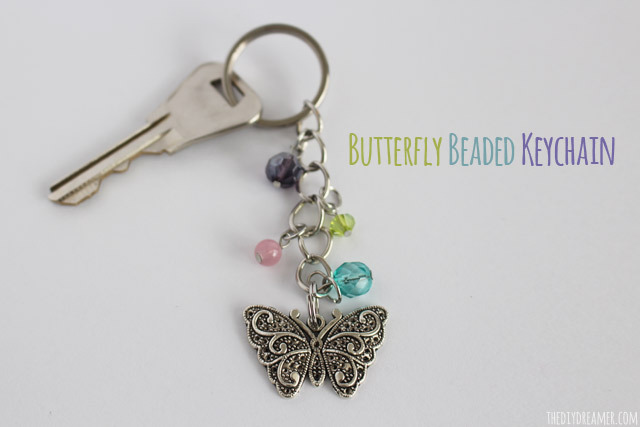 And here you go, you have yourself a Butterfly Beaded Keychain! 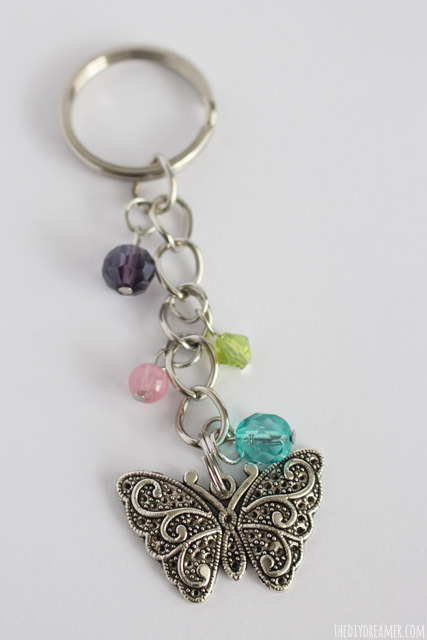 Aren’t the butterfly keychains super cute? 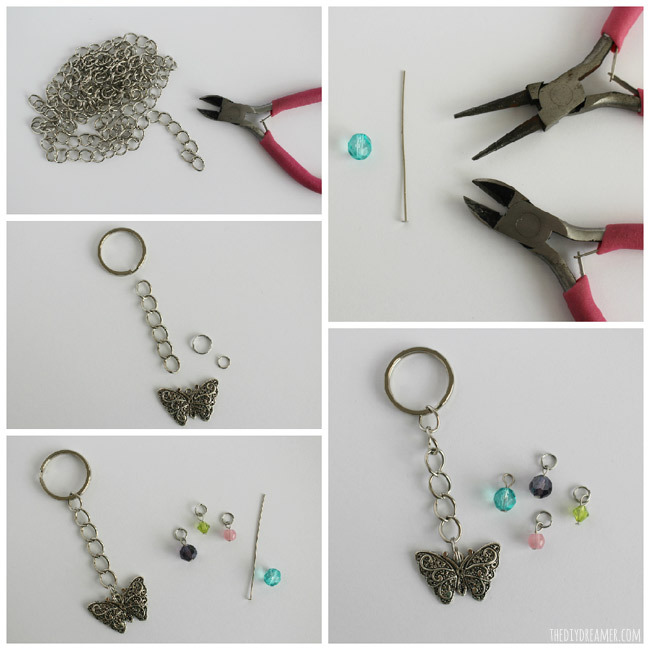 What I especially love about this tutorial, is that you can use it as a base for any keychain you’d like to make! 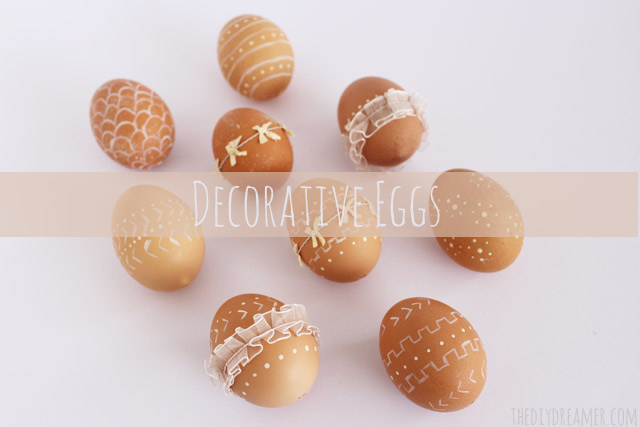 If you liked this tutorial, I know you’ll LOVE these fabulous Easter Projects! 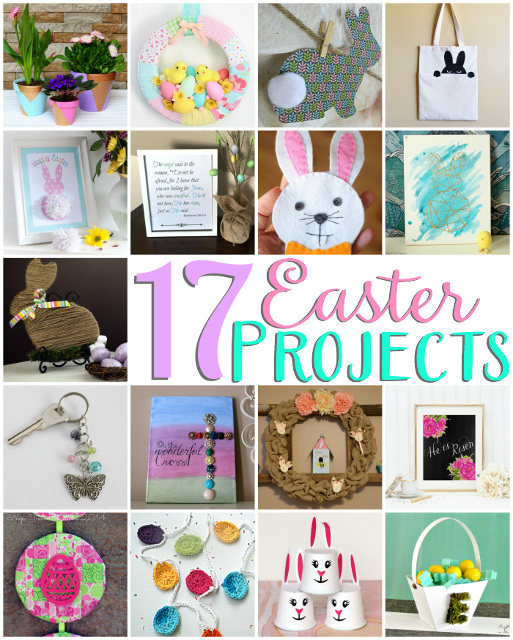 17 Fabulous Easter Projects that you can make! Pastel and Gold Painted Flower Pots by Happy Go Lucky. Spring Chick Wreath by Fynes Designs. Simple Bunny Garland by Lil Mrs Tori. DIY: Peek-A-Boo Bunny Bag by Minted Strawberry. Pom Pom Tail Easter Bunny Printable by TitiCrafty. Easter Bible Verse Printable by A Cup Full of Sass. Felt Bunny Pouch for Easter Treats by Do Small Things with Love. Gold and Watercolor Geometric Bunny Art by Spool and Spoon. Moss and Twine Wrapped Easter Bunny by The Southern Couture. 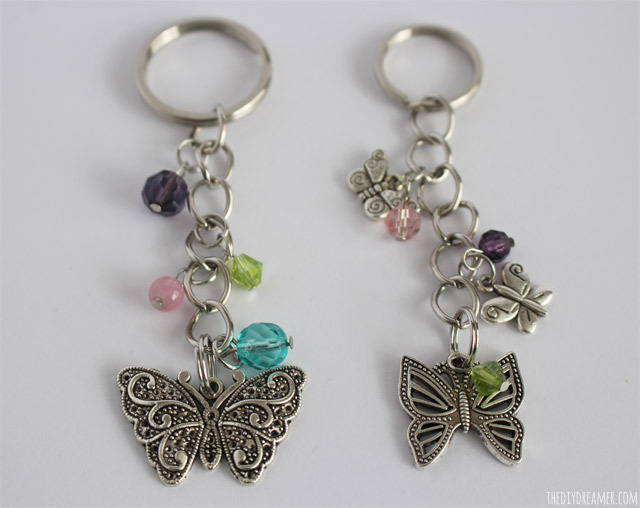 Spring Keychains by The DIY Dreamer. Cross Canvas by Vintage Gwen. DIY Ribbon Bunny Easter Wreath by Sweet Tea & Saving Grace. Floral Chalkboard Easter Prints by Dawn Nicole. Quilted Easter Decor by Nap-Time Creations. 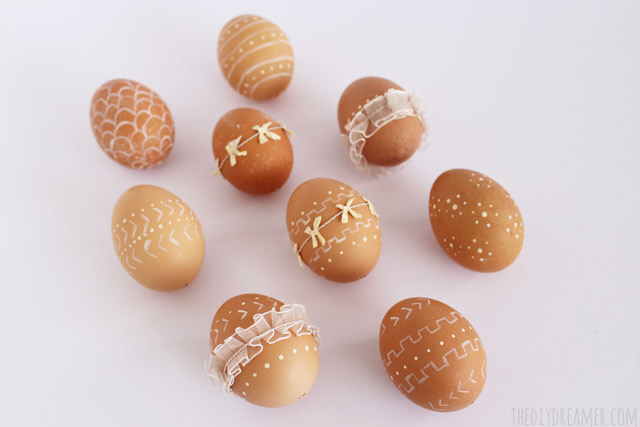 Crochet Egg Garland by 4 You With Love. Easter Bunny K-Cup Sleeves with Free Cut File by Pitter and Glink. Paper Easter Baskets by Crafting in the Rain. 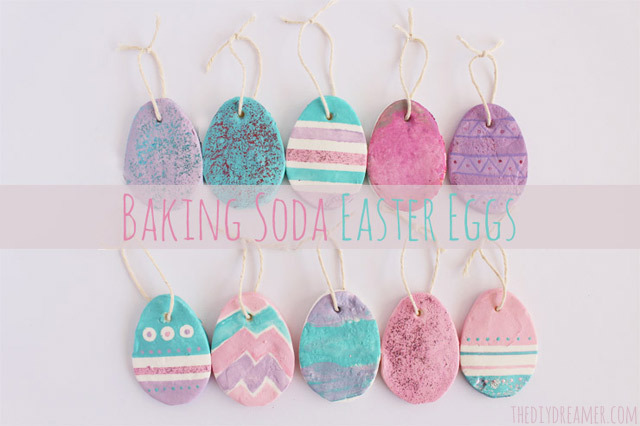 I sure hope you enjoyed all these Easter Craft Ideas! Don’t forget to PIN and/or Share with your friends! Previous Post: « Customize your fridge easily with Frigidaire Gallery Custom-Flex! 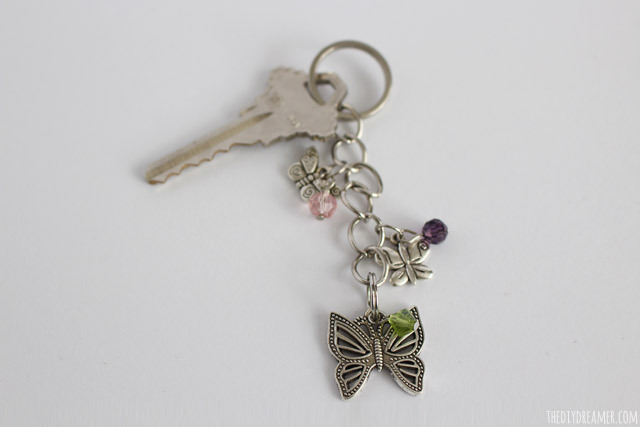 I clicked your post on Titus 2 Tuesday because of the butterfly keychain – butterflies are very symbolic for me. And I was so happy with all of the other treasures you had on your post!! I am sharing on my weekend blog round-up this Friday AND on my homeschool support teacher site – I have that set up for the families I work with. Sorry – my full name didn’t appear. 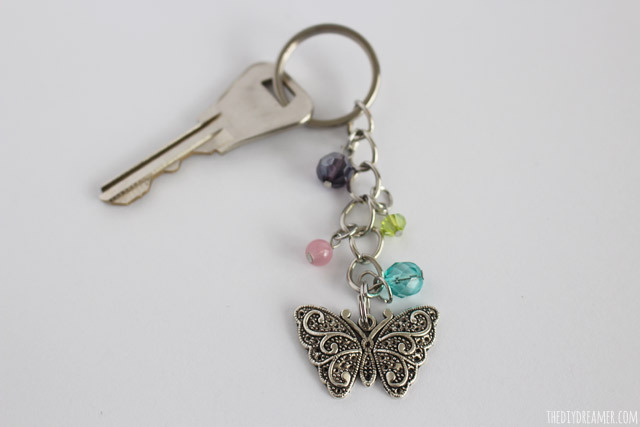 I LOVE how your keychain turned out! Thanks so much for being a part of the blog hop. Hugs! Pretty idea Christine! Would make a great easter basket gift for a teen! Thank you so much for this tutorial – it gives me all sorts of inspiration!